The food we eat daily provides us the basic materials needed to build and sustain the body. In our prime, we can seemingly eat anything and digest it, absorb it, assimilate it, and utilize it. But as we age, stomach acid and enzyme production decrease, digestion worsens, absorption and assimilation of nutrients becomes less effective. The process of getting nutrients into our cells, and eliminating waste products become less effective. 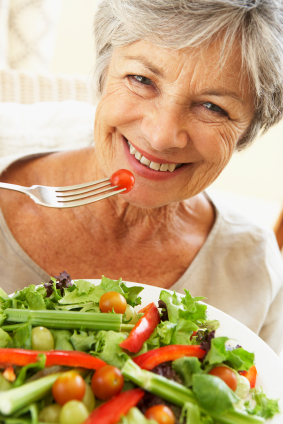 The basic starting point for any anti-aging effort is to eat all the necessary nutrients and enhance the mechanisms for digestion, absorption and assimilation. Most people tend to think of their bodies as a self-contained object like a table or maybe a chair. Yes we need to eat food and drink water or our bodies’ equilibrium can be thrown out of balance. But the tendency of most people is to think of themselves as the same today as we were yesterday. Nothing could be further from the truth. In fact, we are constantly tearing down and rebuilding every organ, cell and DNA molecule we possess. Even our bones are constantly replacing themselves. The material for all this renovation is food. Any deficiency in the needed materials, even in the short term, and our body will cleverly sacrifice one part to repair another — like scavenging muscle for protein to repair sunburned skin. But if a deficiency persists, some aspect of our physiology will break down and we become “diseased”. The body is an amazingly complex system; its nutritional requirements are equally complex and yet humanity has been thriving on a wide range of regional diets for a long time. People of the most primitive cultures tend to make the best of what foods are available and the physical conditions that prevail. Currently though, the goal is to eat so well that we get all the nutrients we need to maximize our health and life span, and to avoid functional decline (and pain) as long as possible. Your body needs fuel and raw materials from carbohydrates, fats and proteins to keep your brain and body going throughout the day. You also need smaller amounts of essential nutrients called vitamins and minerals to keep your body’s systems running right. As we grow older, it is even more essential for us to learn the basic principles of obtaining, digesting, absorbing and assimilating all the right nutrients the body requires for good health and longevity.